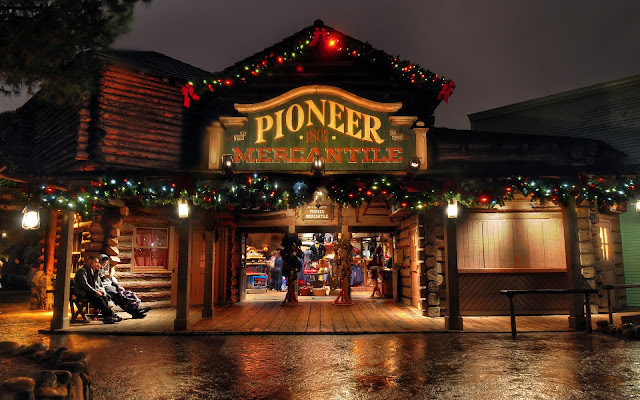 A couple of weeks ago, as I wandered around Disneyland in after an early evening drizzle, I couldn't help but notice how great the buildings in Frontierland looked with the wet pavement and their Christmas dressings on. It was a scene out of a nostalgic, rainy Christmas evening, serenity setting in after a long and busy day, the last few citizens straggling home to their families. My thoughts harkened back to simpler times, pondering what the holidays might have been like for the early settlers. With life as rough as it was back then, Christmas time surely must have been a time for great celebration, thanksgiving, and cherishing of blessings. Well, I certainly cherished the moment. The Pioneer Mercantile, late at night, in its Christmas garb.